Got a few minutes and clear skies? 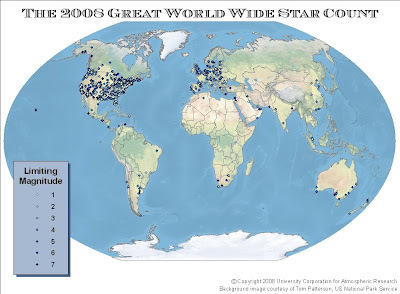 You can help contribute to an annual citizen science project, the Great World Wide Star Count! As a part of the "Windows to the Universe" program of the International Year of Astronomy, the Great World Wide Star Count runs from October 9-23, 2009. The purpose of the star count is to determine world wide light pollution levels. Each year, the study is repeated, so that we can see the effects of light pollution across the world! Being part of the World Wide Star Count is actually very easy. To submit your observations, simply follow the instructions on their website. Basically, you will download a series of magnitude charts, that show an easily identifiable constellation. Then you simply match which magnitude chart best fits the view you have from your location. Then, just submit this observation, along with your location and time, and you will have contributed to a great citizen science project! The image above shows last year's results, which are then compared to the previous years results to gain a better understanding of changing light pollution levels. One aim of this project is to bring awareness of light pollution levels to the public, hopefully resulting in better lighting practices and regulations. I am very enjoyed for this blog. Its an informative topic. It help me very much to solve some problems. http://topassignmentwriters.com/Its opportunity are so fantastic and working style so speedy. I think it may be help all of you. Thanks a lot for enjoying this beauty blog with me. I am appreciating it very much! Looking forward to another great blog. Good luck to the author! all the best! Many thanks for the period lots of that will for everybody proven those activities close to. My personal team is actually requiring you to ultimately carry on along with types personal outcomes. At the moment click here cash advance carson Bless a person created for composing.